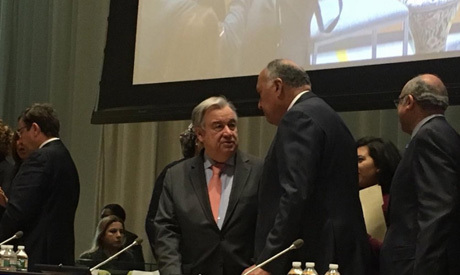 Egypt's Foreign Minister Sameh Shoukry is attending on Tuesday in New York the Group 77 (G77) ceremony to mark the handover of the group’s chairmanship from Egypt to Palestine, Shoukry’s spokesperson Ahmed Hafez tweeted. "Egypt strove to represent the interests of the G77... we pushed forward the group’s objectives and values of equality and justice for which we aspire in the international system and the United Nations," Shoukry said during the opening speech at the ceremony. The ceremony is held at the UN headquarters in the presence of Palestinian President Mahmoud Abbas and UN Secretary-General Antonio Guterres. During his speech, Shoukry highlighted that "G77 exerted tremendous efforts to reinforce the organisation’s ability to deal with challenges related to peace & security; especially, through developing preventive diplomacy, addressing roots of conflicts, and supporting cooperation with regional organisations." "We further focused on the priorities of eradicating poverty, youth employment and production capabilities ... and we succeeded in advancing our vision." Egypt's third time chairing the G77 is part of the country's leading role in serving the interests of developing countries and its belief in the principles and goals of the group, Hafez said. The G77 and China is the main negotiating bloc in the UN for developing countries that works on boosting the economic and development interests of its members.